Is there any competition fiercer than the war between two muscle cars? The hardest steel is forged in the hottest of fires. For the track day muscle car enthusiast, the fact that Ford and Chevrolet keep turning up the heat on each other is a good thing because it means that the Camaro and Mustang just keep getting better and better. The two companies have been doing this dance forever. One drops a game-changing product and the other retaliates a short time later with an even better model. Recently Ford was leading the race, with the Mustang Shelby GT350R setting the pace. 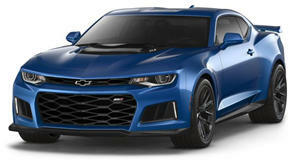 Now, Chevy has answered and it seems like the Mustang may be screwed. GM recently took to the Nurburgring to test out its new ZL1, essentially the ultimate track package that a Camaro owner can buy. Chevy recently showed the world that it has more than enough racing know-how to build a track car that can upset the natural order of things when its V6 1LE Camaro nearly beat a 707-horsepower Dodge Charger Hellcat in Car and Driver’s Lightning Lap comparison. This happened despite the fact that it only had 335 horsepower to smother the track with. It seems as if the only thing that was lacking on the 1LE was some more horsepower, a problem that the ZL1 takes care of and then some. With a supercharged 6.2-liter V8 pushing 650 horsepower and 650 lb-ft of torque to motivate the insanely capable track car, the Camaro ZL1 managed a record Nurburgring time of 7:29.6. This is blisteringly quick, a full 3.0 seconds faster than the Mustang GT350R and 11.7 seconds faster than the previous-generation ZL1. What’s more is that team Chevy did it with a stock spec ZL1 fitted with nothing more then a six-point harness and performance recording hardware to record the run. The driver even left the 10-speed automatic in auto mode, allowing the computer to decide when to shift. It’ll be interesting to see how the ZL1 Camaro stacks up during a direct comparison with the GT350R. Watch how the record lap unfolds from the driver's seat here.